Advanced Dining Reservations (ADRs) can be ‘all the rage’ to those that plan their Disney vacations months in advance. Many people do claim those hard-to-get ADRs right at 180 days out, but for those that decide to book their Disney Vacation less than 180 days out… what then? Allow me to introduce to you, WDW Table Finder! Mike, the brains behind this site, created this site to allow guests to search for dining reservations over a period of days, rather than one day at a time. To go a step further, for premium members, dining reservation requests (or ‘Notifications’) can be set-up to run a continuous search – and be notified as soon as something opens up! Purchase any Premium Account to be able to search for an ADR over multiple days! Click on the blue “time” text that you’d like to reserve and be automatically taken to Disney’s Dining Reservation page! Anyone can sign up for a FREE account. For many of you, the free account is all that you’ll need. 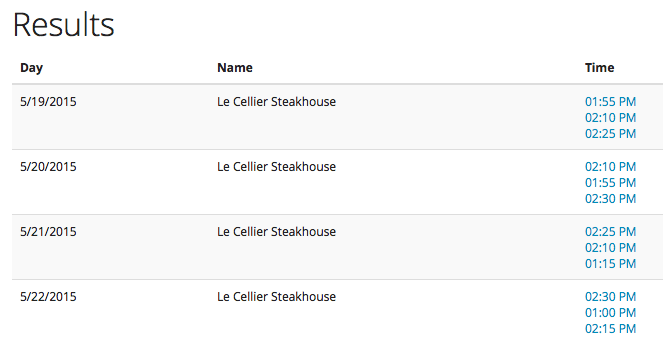 With a free account, you can search individual days for the restaurant of your choice, # of people and time frame. For those of you that want to search over multiple days at once for a reservation, a premium account is needed. With a premium account comes wider search range possibilities plus the feature of ‘Notifications.’ If a particular reservation isn’t available, you can set up a notification for it – enter your date, # of people and time frame for the restaurant you want. WDW Table Finder will then search for openings multiple times per hour and send you an email if/when it becomes available! I tested this feature out and it worked nicely! I set up a notification request for Sanaa for 2 people at lunchtime a week from now, then I logged out. Shortly after, I received an email notifying me that 3 times were available during lunchtime at Sanaa. But it didn’t stop there… every hour I received a notification email letting me know of the times that were still available. This feature is actually helpful, because if I’m away from my computer for a few hours, I may miss the availability of an ADR – but if I check the most recent email, I have better chances of securing one of the time frames mentioned. You can always turn off or delete the Notification in your account once you have secured your ADR. Travel Agents!!! This tool could make it or break it for those hard-to-get client ADRs. You know you have clients that wait until the ‘last minute’ to ask about dining choices and think they can still get into Be Our Guest 3 weeks before they arrive. Set up a notification for Be Our Guest! 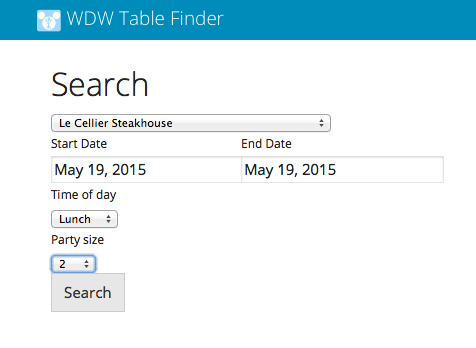 Let WDW Table Finder do the dirty work for you and save you the stress of searching over and over yourself. Basic: $7 – Allows for 1 notification to be monitored at a time. Advanced: $15 – Allows for 3 notifications to be monitored. Pro: $50 – Allows for 10 notifications to be monitored. For the WDW Hints readers (that’s you! ), Mike has offered a discount!! Visit the Premium page to purchase an account. Use the code: WDWHints and receive a few dollars off your membership! Memberships are good for 1 year. Use code: WDWHints to receive the discounted prices shown above! WDW Hints: What gave you the idea to come up with a dining search site? Mike: Frustration. Not frustration on my behalf necessarily, but rather frustration that I saw on message boards, Facebook, and even in the parks from guests. Oftentimes guests spend long nights trying to book tables at some of the most popular restaurants on property only to have no luck. If I can even help one family get a table at Cinderella’s Royal Table, then the hard work is worth it. WDW Hints: How long did it take for you to build the site? Mike: In total, about 3 weeks. I have a day job just like anyone else, so development of the website took place at night and on the weekends. I did have to sprinkle some time in to “test” the site and visit a few restaurants. WDW Hints: When did it officially launch? Mike: February 5th of this year. The response since then has been amazing. We’ve had members thank us for reservations from Cinderella’s Royal Table to Be Our Guest to even 50’s Prime Time. I’m so happy to know that guests will actually be able to make some magical memories with the assistance of my site. WDW Hints: Favorite Disney attraction? Mike: Another tough one. Being an Annual Passholder, I don’t necessarily visit the parks for the rides. If I had to pick one though, I would go with Splash Mountain. It’s a great ride to cool off with on a hot Florida day. From queue to final scene, you really get a chance to get immersed into the story. I also consider it the best payoff for the wait. What I mean by that is that you may wait 60 minutes for the new Seven Dwarfs Mine Train but only get a 2.5 minute ride, whereas Splash Mountain is 11 minutes. WDW Hints: Favorite Disney character? Mike: So I’m actually going to take this as my favorite in-park character experience. While talking Mickey is an awesome experience year-round, my favorite experience has to be Madame Carlotta over at the Haunted Mansion. Madame Carlotta meets with her sister Lady Renata during Mickey’s Not-So-Scary Halloween Party. We were able to talk with her for about a half hour covering a range of topics from her death to her thoughts on her sister. If you find yourself there during the party, I would head over to the Haunted Mansion for a few minutes to listen to her stories. Still thinking about joining? No problem! In the meantime, try to WIN a Pro Account!! Two (2) lucky winners will receive a Pro Account to WDW Table Finder absolutely free! That’s a $50 value!! This giveaway begins Wednesday, March 11 at 12:01 a.m. (eastern) and runs through Tuesday, March 17th ending at 11:59 p.m. Entrants must be 18 years of age and a resident of… the world. That’s right, this giveaway is world-wide!! (Go wild Canada.) Winners will be notified via email on Wednesday, March 18. Use the Rafflecopter form below to enter – Good Luck!